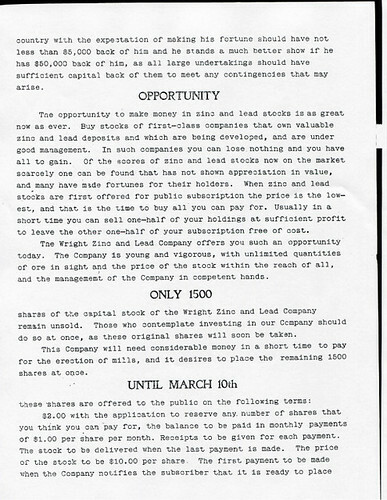 An example of an investment letter, click on image to find larger versions. 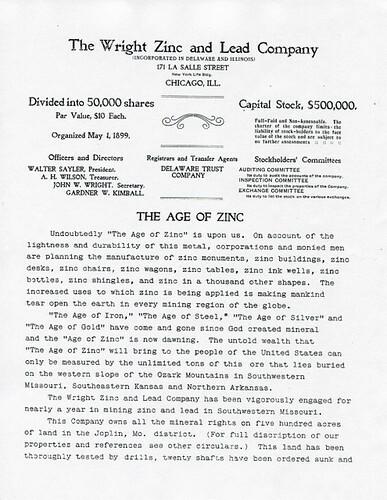 He, along with his fellow officers and directors of the company, sent out circular letters advertising the opportunity to purchase stock in the anticipation that the company would strike it rich in the lead and zinc mines of Southwest Missouri. The company owned over 500 acres of land divided between four properties. 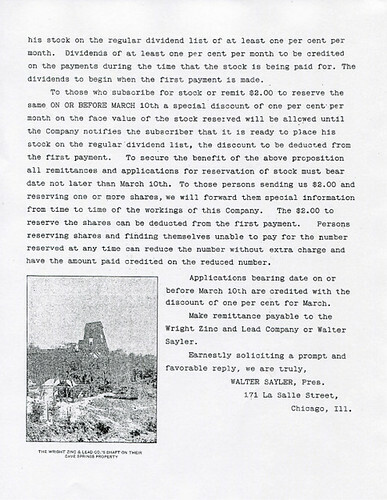 Wright Lead and Zinc planned to sink twenty shafts across its four properties, and expected to make an estimated $40,000 per month before payroll, royalties, material, and other costs, leaving a $20,000 profit. 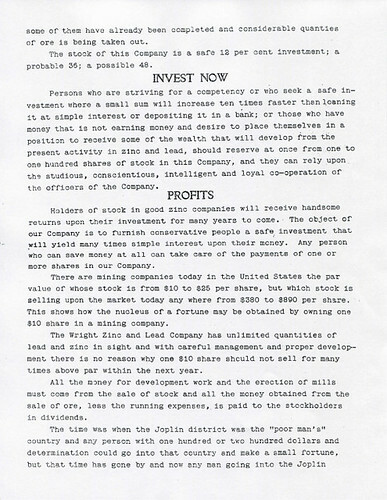 It was in Joplin that one tenderfoot, along with his partner, was seemingly hoodwinked by two seasoned local miners when they purchased a piece of land long thought tapped out. But the two greenhorns, not knowing any better, worked their land and eventually struck a new vein of ore that allowed them to buy a new hoist and other mining equipment. Within a few months, they had cleared $33,000 in profits. Then there was the story of a young man from Kansas City who, with $150 in capital, began work on a modest claim. He found enough ore to build a mining plant which he then used to bring up $30,000 out of the mine. But the days of luck were over. Within a few decades the mines of Joplin would stand still, only to fade away, leavening behind faint memories of a proud mining history. This page took 1.594 seconds of computer labor to produce.